^ a b c d e f g h i j k Oddsdóttir M, Hunter JG (2005). "Gallbladder and the extrahepatic biliary system (chapter 31)". In Brunicardi FC, Anderson DK, Billiar TR, Dunn DL, Hunter JG, Pollock RE. Schwartz's Principles of Surgery (Eighth ed.). McGraw-Hill. p. 1203. ISBN 978-0-07-141090-8. ^ McAlister VC, Davenport E, Renouf E (2007). McAlister V, ed. 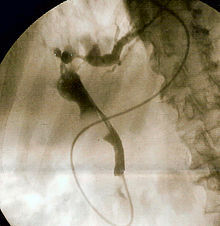 "Cholecystectomy deferral in patients with endoscopic sphincterotomy". Cochrane Database Syst Rev (4): CD006233. doi:10.1002/14651858.CD006233.pub2. PMID 17943900.